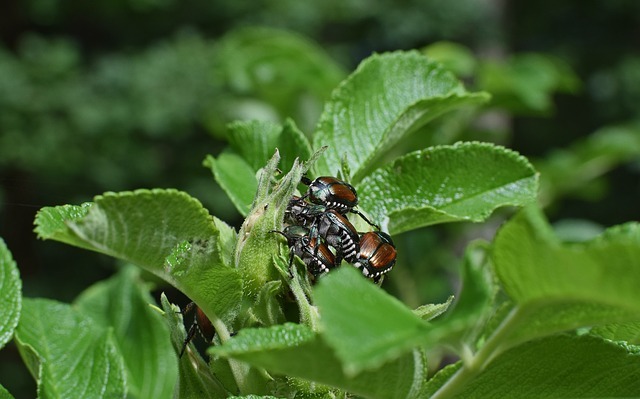 Controlling The Insect Menace of Japanese Beetles – Ekana Nursery & Landscaping, Inc.
With summer comes the endless stream of insects trying to gobble up your garden and turn your plants into their evening meal. Japanese Beetles may look beautiful with their metallic-green shimmer and copper colored wings, but these monsters can make short work of your favorite plants. Learn the best way to control these insects and keep your flowers and plants safe. We’ve grown up with these insects terrorizing our plants and drowning in our pools, but their reign of terror is rather short. They start popping up around the end of June and return to the ground around the end of July. In-between that time, they eat. plant leaves and flower blooms, but you’ll also see the insects as they have no shame when snacking. If you don’t have a lot of flowers and plants, then you might be able to manage with pulling the bugs off and throwing them in a bucket of water. A natural insecticide called pyrethrin is also a great way to get rid of them. Pyrethrin is a natural pesticide found in chrysanthemum flowers and excites the nervous system of the insects, causing them to die. Spray pyrethrin on your plants and next time the Japanese beetles feed, the insecticide will take care of them. If you have a large yard, then you can try using Japanese Beetle traps. These traps contain attractants that entice them away from your plants and into collection bags for easy disposal. These traps can cover about 5000 feet and you should only keep them out for a day or two every few weeks. The biggest issue with traps is they can potentially make the problem worse by attracting neighboring Japanese beetles. It’s like screaming from the rooftops that you’ve got food and mates for them. It’s always best to get ahead of a problem, so take care of your beetle issue before it becomes an actual issue. Beetles start out as grubs in the ground and develop into the Japanese beetles. One of the most effective ways to control grubs is with beneficial nematodes. These are small worms that live in the soil, seek out the grubs, enter their bodies and release bacteria that kill them. Nematodes are applied to your lawn live, so make sure to take care of them and use them promptly after purchase. You don’t want to use dead worms as that doesn’t help anyone. Ekana Nursery and Landscaping can help you control your beetle problems as well as outfit you with the best plants around.